A wide range of historical tents, knight's tents and sheds are an essential part of every medieval event or tournament. Most of today's medieval events take place in the open air and their participants spend their time mainly in the camp. This is the place where they sleep, eat, prepare for tournaments and battle stagings, but also enjoy their selves. Tent is a shelter used by people since ages, and that's why camp became an important element of historical reenactment. Over the years tent was changing in terms of its construction and look. Medieval tents were used, among others, by chivalry during armed and legative expeditions, both in Summer and Winter. They were part of medieval camps. Here, every reenactment and historical festival lover will find a shelter meeting one's requirements - both among linen tents or cotton tents. If you haven't found a medieval tent model that interests you, write to us and we will estimate the cost of a tent designed specially for you. To produce our medieval tents we use high quality fabrics impregnated for water and fungus resistance. Impregnated cotton, colour and natural, basis weight 340g/m2. Impregnated linen, basis weight 650g/m2. How did tent in the Middle Ages look like? Among the simplest shelters it is worth to mention the sheets of fabric outspread with ropes between trees, and simple huts. The large sheet on wooden poles is called a shed, and it is a perfect choice for reenactors who value the feasts beside the medieval table. Travelers will surely make a use of smaller sheds, called soldier sheets. This type of shelter is much simpler than any medieval tent, but still very effective. Often sheds, standing near the fireplaces, make up the center of the camp life. Historical paintings and artistic works usually present historical tents in the form of an "umbrella, "pavilion" with two poles, or a cone. On our website, among the mentioned, we also proffer medieval tents of other shapes, both small, for one person, and bigger, polygonal, appropriate for a whole fellowship. Depending on your needs, you can choose from pavilions with one or two poles. Both versions are available with or without guy wires, as umbrellas. What is more, in our shop you can find early Norman tents, late Soldiers and Mini Soldiers, and cone tents of different sizes. To make our medieval tents we use impregnated fabrics of high quality to achieve the best resistance to water and mold. Tents are made of impregnated cotton, colored or natural, of basis weight around 340 g/m2, and impregnated linen of basis weight around 650 g/m2. We give you a tent cotton of many colors to choose: white/ecru, red, blue, yellow, or black. How to make a historical tent more attractive? Additional colors - thanks to cotton of different colors we can prepare historical tent in two or more additional colors. A windshield - a stripe of additional fabric of 20 cm width, protecting from wind and moisture, stitched to the lower edge of a medieval tent. Decorative tapes - colorful tapes on stitches. Made of cotton of 3 cm width. Lining - additional layer of fabric placed on the inside of a medieval tent, covering its walls. It can be made in any color. 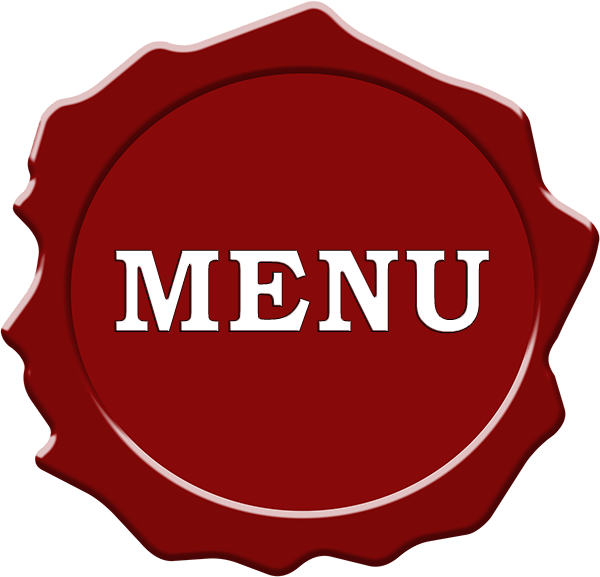 Decorative merlon - different from the standard (simple one). Three options available: waves, tooth type, crenels. Hand painted medieval tent - made according to customer's suggestions. We can also prepare curtains to divide the inside of a medieval tent into separate spaces. We do not limit ourselves only to medieval tents. We are able to make a tent from every other historical period. Call us or send us a message with sketch or picture, and we will prepare an individual offer for the historical tent or shed you need. 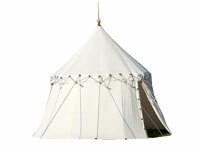 We can make a custom size medieval tent, a trading Saxon, a Viking triangle, or a large stable tent. 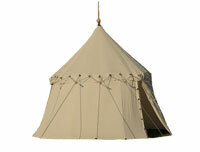 In this section you will find a wide and well-thought range of historical and medieval tents! If you need a shelter for the staging of the Battle of Grunwald or Viking's festival, a knight's tent for one person or for a whole fellowship, cotton medieval tent or linen medieval tent, you are in the right place.